8/16/32 Port Compact GSM Modem Pool GSM/GPRS engine that can be based on Siemens TC 35 i and SIM COM SIM 900 and SIM 300 Series Modules. PN: For neutral branding or customized branding please contact. 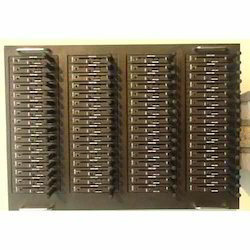 An ideal solution for software houses and developers who need to work on multiple modems on one single computer. Imagine the hassle of connecting multiple modems in the past, running 8 modems will require 8 cables and 8 COM ports. Now with I2R Labs™ revolutionary technology, you can run 8 modems using only 1 USB cable. The product can be staked to make 16/32/64 or more. Our typical average SMS performance for sending 100 SMS using 8 port modem is 35-50 sec. I2R Labs™ modems, your ultimate solution. 32 Ports GPRS Modem Pool USB/PCI is designed for optimum performance and longer service life. This range comes with industrial design and freezes automatically. It comes with removable and is easy to maintain. 32 Modem in one box, it is convenient and easy to maintain. It has a big and small SIM card slot. This range is independent of each audio input and output. It also supports microphone and audio access options. We extend a quality complaint range of 8 Ports GPRS Modem Pool USB/PCI in different models and shapes. Our procurement team sources finest quality material to carve it in industrial designs. It offers seamless performance without freezing and any signal loss. This range comes with an automatic switch. The ports of it are easily removable, easy manageable and easy to maintenance. It is demanded for its compact design that delivers exceptional performance. 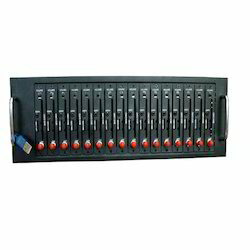 In addition, it is independent of each audio input and output, support microphone and audio access. We are offering 16 Ports GPRS Modem Pool USB/PCI in desired shapes and makes. This range has a beautiful industrial design that allows no signal loss. Each port in this range comes with an independent switch controlled. The ports are individually removable, very easy to maintain. It is a 16 modem in one box that has big and small SIM slots available. Our range of modem supports microphone and audio access. 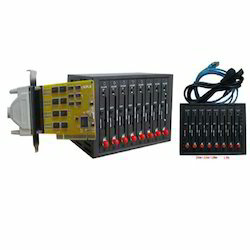 Our range of 64 Ports GPRS Modem Pool USB/PCI which comes with GSM/GPRS /EDGE networks in customized and standard models. The frequency band on which it operates is 850/900/1800/1900MHz. This range is based on wave com module Q24 plus, Q 2686 and Q 2687. Siemens module MC 55 i enables fast processing and supports SMS, MMS, Voice and Fax. It supports Windows 2000/Me/XP, SCO UNIX, SCO XEINX and Linux operating systems. Looking for GSM Modem Pool ?